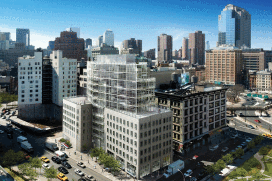 While the green building movement continues to rapidly gain steam, building owners, architects, engineers and contractors have adapted their best practices to the ever-evolving sustainable design standards. A large part of this movement has been the LEED Green Building Rating System, introduced by the U.S. Green Building Council (USGBC). The program recognizes best-in-class building strategies and practices, and certifies buildings that save money and resources, have a positive impact on the health of occupants, and promotes renewable, clean energy. The approach of the sustainable structural engineer starts with the materials selected for construction, namely concrete, masonry, steel and wood. 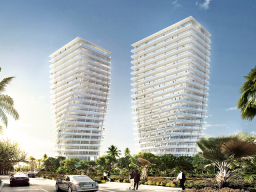 Concrete is a primary component of Grove at Grand Bay’s structural design, which has been designed to achieve LEED Gold certification. While an essential structural material used in nearly every structure built today, the production of portland cement contributes about 1.5% of the United States’ annual carbon dioxide emissions, and up to 7% worldwide. Its production produces approximately one pound of CO2 per pound of cement, driven by the chemical reaction and combustion of fossil fuels. The amount of cement in concrete can be reduced by substituting fly ash or slag for cement. While fly ash has less embodied energy than Portland cement, it cannot be used in large quantities because it reduces the concrete’s alkalinity—something that is critical in protecting reinforcing steel from corrosion. Typically, fly ash replaces cement at 15% to 25% by weight, and slag replaces cement at 15% to 40% by weight, with little effect on concrete mix design, placement, curing, and finishing. Using fly ash and slag at these proportions provide minimal cost impact; improved workability, finishability and pumpability; no change in plastic shrinkage or abrasion resistance; and less bleeding. The existing masonry was preserved and renovated as part of One York’s conversion from warehouse to high-end residential condos. The use of concrete masonry provides many sustainable benefits throughout the structure’s life. With sustainable features apparent from the start, many concrete masonry materials can be recycled for other projects into new masonry materials or aggregates. As a system, it addresses moisture penetration, air infiltration, thermal performance and lifelong resiliency. When designing such a system, the focus is on the delivery of a high performing system that continues to provide payback to the owner in terms of energy and maintenance costs. In some instances, a structural design can reuse existing masonry buildings, whether it be the entire structure or its masonry core. If new materials are required for a project, these units are often manufactured locally and reduces the transportation requirements associated with material delivery. Unlike light framed construction, masonry remains warm or cool long after the heating or cooling system has shut off, reducing loads and moderating indoor temperature fluctuation throughout the year. Masonry also offers improved indoor environmental quality by eliminating plaster or paint if an architectural finish is desired, and it reduces the potential for mold growth because masonry does not provide a food source for mold. Where feasible, a structural engineer can specify lightweight or aerated concrete masonry units to decrease resource depletion, reduce transportation energy impact, and increase concrete unit masonry wall insulation values. 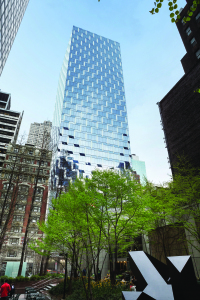 International Gem Tower in New York, NY utilizes structural steel framing throughout. Under the LEED system, structural steel receives maximum credit for its contribution to the overall rating for a structure, due in large part to its recycled content and recycling rate. It is the most recycled material used in modern building construction with a nearly 80% recycling rate in the United States. While total recycled content varies between mills, the primary method used—Electric Arc Furnace (EAF)—uses 95 to 100% old steel, and can achieve up to 97.5% recycled content for beams and plates, 65% for reinforcing steel and 66% for steel deck. At the end of a building’s life, 98% of all structural steel is recycled back into new steel products with no loss of its physical properties. While it is unnecessary to specify minimum percent recycled content for steel on a project, should there be a desire to reuse entire pieces of steel from one structure to another, the structural engineer should pay attention to the existing steel qualities. This particularly includes type and grade, member size, as well as previous loading, environmental exposure, and surface preparation. 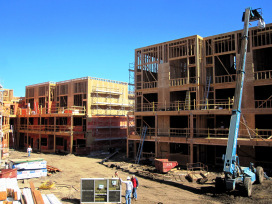 Bakery Lofts 3 & 4 in Oakland, CA utilize wood as the structural framing material. Of the major structural materials, wood is the only conventional building material that is renewable, biodegradable, non-toxic, a natural insulator, and improves air quality as it matures. A quarter of the world’s consumption of wood is used in building products, and innovations in engineered wood products and manufacturing processes are shifting how structural engineers utilize wood in ways that could have long-lasting ecological benefits. Waste in the manufacturing process of engineered wood products is quickly approaching zero, with 97% of all byproducts being reused in items such as composite structural members, paper, and fuel. From an energy efficiency standpoint, wood is 400 times more insulating than steel and 15 times more insulating than concrete, which allows designers to take advantage of its natural insulating properties. As a sustainable structural engineer, one must focus on efficient framing, alternative products, and sustainable material suppliers. Rethinking the way wood construction is detailed can significantly reduce a project’s wood waste. This includes laying out the building framing in dimensions that are multiples of either 16 or 24 inches to accommodate board and plywood sheets’ typical sizes, making use of engineered wood products created from manufacturing waste, specifying the use of reclaimed lumber, and designing with the most efficient grade of material to serve its purpose. Alternatives to solid-sawn lumber are quickly becoming the norm, including products such as Cross-laminated Timber, Laminated Veneer Lumber, Laminated Strand Lumber, and Parallel Strand Lumber, and Oriented Strand Board. These products are primarily made from manufacturing waste and have the secondary benefit of reducing the harvesting of large solid sawn pieces of virgin timber, which can be damaging to our environment. Structural engineers should continually seek innovative solutions in response to the industry-wide emphasis on sustainability by pursuing innovative and sustainable materials and efficient structural configurations. By seeking creative ways to incorporate these materials wherever possible, the structural engineer can not only aid the quality of the built environment, but the earth’s environment as well.